Beth's Famous Glazed Donuts Recipe | Homemade Krispy Kreme Donuts! Beth’s Famous Glazed Yeast Donuts are light, fluffy, easy to make, and done in just a few hours with a rich and creamy glaze to go on top. I’m updating this post from 2009. You GUYS I have been at this a very long time. This recipe is from my sister-in-law Beth who is a fabulous cook (she’s a professionally trained chef actually!). I remember her and my brother coming down from Idaho at Christmastime to visit us in our tiny 600 square foot apartment in Provo, Utah. They were newlyweds and I didn’t know Beth well. They came down to ice skate and she made these amazing donuts for us. I took a picture and wrote up the recipe and have made it time and time again for years and years after. Fast forward almost 10 years, we’ve added 5 more kids between our families, Tyler and Beth have moved from Idaho to Kentucky and now they live here in my tiny town in Southern Utah! That’s right, after all these years and miles between us I’m lucky enough to call Beth my neighbor as well as my friend. She doesn’t like to fry things very much, so we have this deal now that she makes the dough and cuts the donuts and then she shows up at my house and I fry them up. We make this recipe by our joint effort a few times a year and it’s so special to me. I love this recipe because it’s just making a standard (but very tender) yeast bread dough and turning it into donuts. It doesn’t have a long chilling time, it’s easy to put together with simple ingredients, and the donuts are perfectly light and fluffy but still have a nice chew to them. 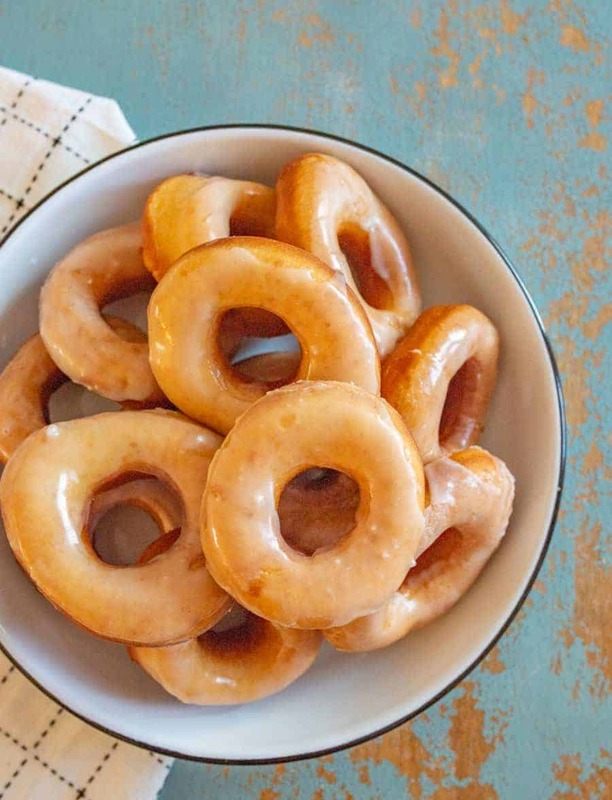 This is an excellent glazed donut recipe and one that can make you famous in your own family! The dough should be very soft but not overly sticky. It’s ok if it’s a bit tacky, but if it’s sticking to your hands and won’t come off, you need a bit more flour. To scald the milk I just stick it in the microwave and get it nice and hot. But be sure to let it come down to around 110 degrees F. If you add the milk to your yeast mixture while the milk is too hot you can kill your yeast which will ruin the recipe. Don’t have a donut cutter? I LOVE these biscuit cutters and the largest one with the smallest one as the hole works great for this recipe. How do you make glazed donut icing? Beth and I use a mixture of melted butter, powdered sugar, vanilla, and a liquid to thin it out (in this case water, milk and cream also work well). I think the butter really makes the icing great instead of just a milk and powdered sugar icing. You can make a chocolate glaze by adding 2 tablespoons of unsweetened cocoa to the powdered sugar and adjusting the water or milk as needed. 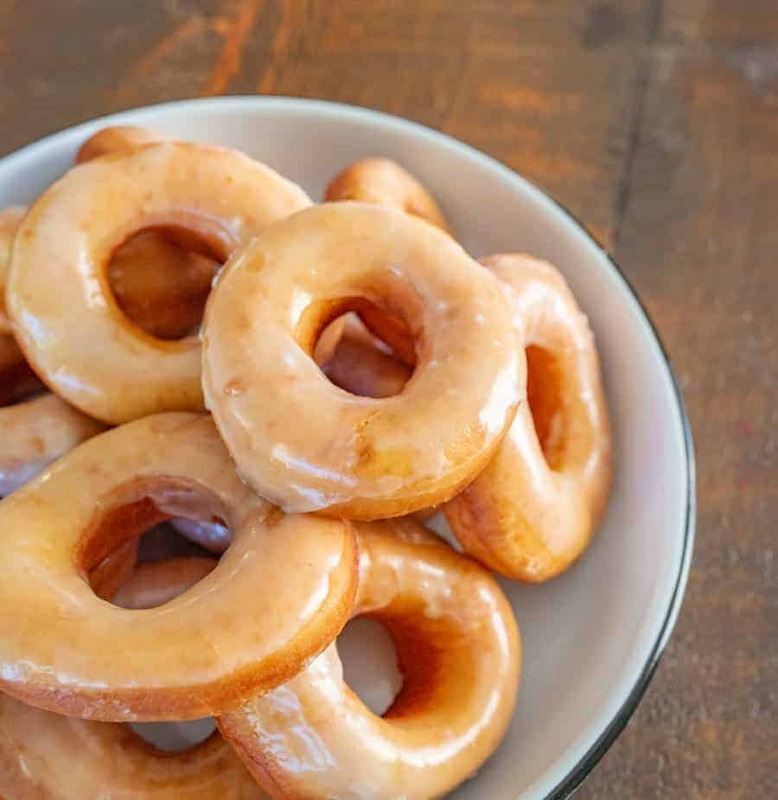 These donuts are also great tossed in powdered sugar or a cinnamon and sugar mixture. If we are frying them up for a party I’ll often make chocolate and vanilla glaze AND powdered sugar and sugar cinnamon donuts so that people have a lot of choices. Dissolve yeast in warm water in a medium bowl, let rest for 10 minutes. Add milk, sugar, salt, eggs, shortening or butter, and 2 cups flour. Beat on low for 30 seconds, scraping bowl constantly. Beat on medium speed for 2 minutes, scraping bowl occasionally. Stir in remaining flour until smooth. Turn dough onto floured surface; roll around lightly to coat with flour. Gently roll dough 1/2-inch thick with floured rolling pin. 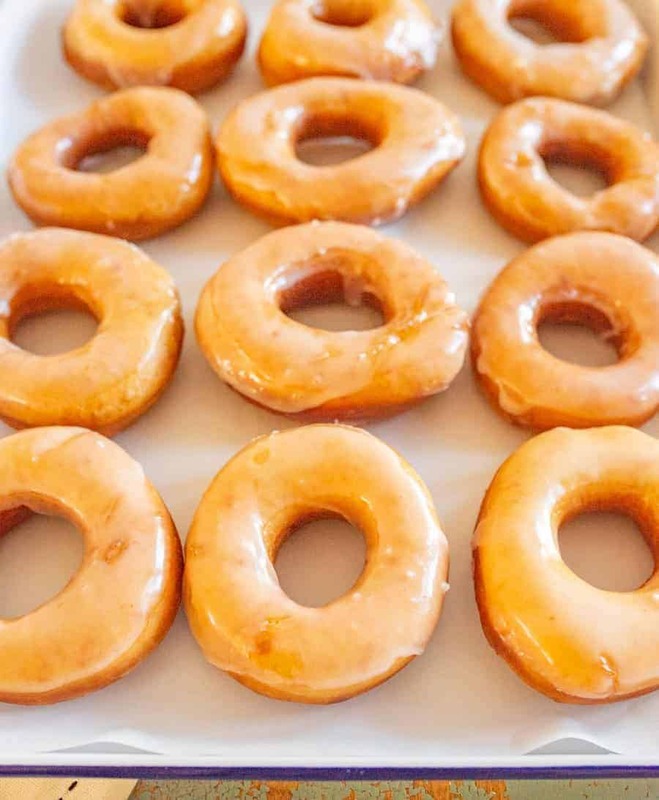 Place cut donuts on a parchment or baking mat lined baking sheet. Cover and let rise until double, 20-30 minutes. 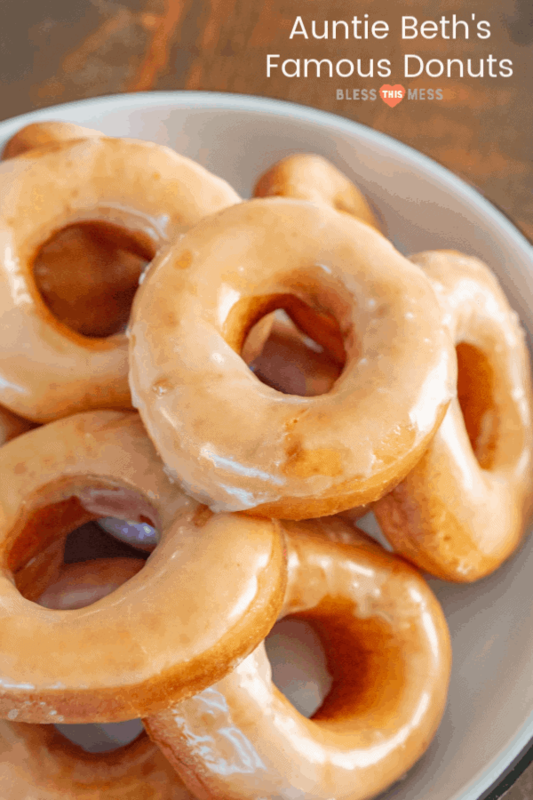 While the cut doughnuts rise, make the creamy glaze – heat butter until melted. Remove from heat. Stir in powdered sugar and vanilla until smooth. Stir in water, 1 tablespoon at a time, until desired consistency. Heat vegetable oil in deep cast iron skillet to 355 to 365 degrees F (use a thermometer here, it makes all the difference!). Slide doughnuts into hot oil with wide spatula. Turn doughnuts as they rise to the surface. Fry until golden brown, about 1 minute on each side. Remove carefully from oil; drain on a double layer of paper towels. 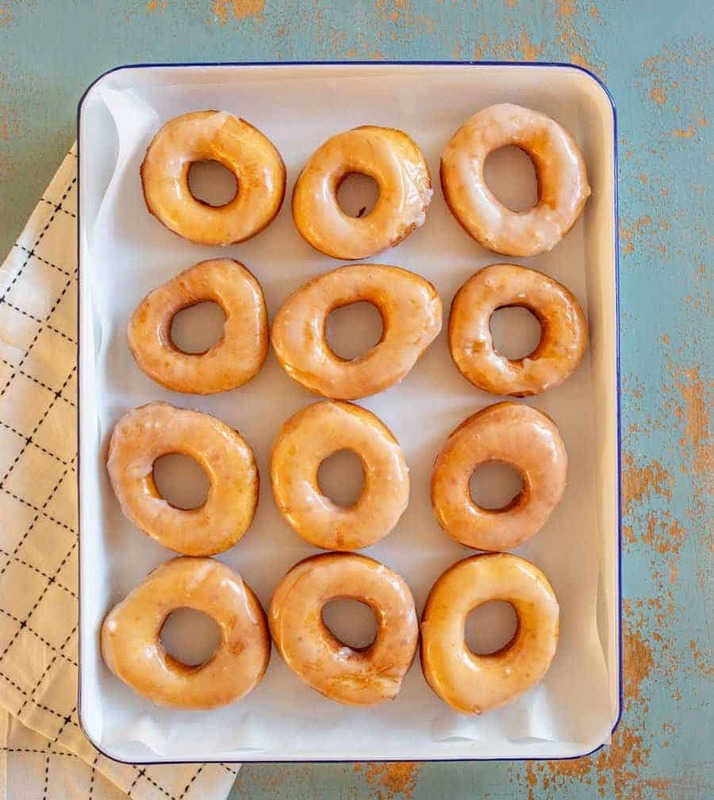 Dip the hot doughnuts into creamy glaze, then set on cooling rack set inside of a rimmed baking sheet to collect the drips. Best enjoyed warm with friends. Old Fashioned Buttermilk Doughnuts from my friend Annalise at Completely Delicious – one of my favorites! Donuts are my happy place! They are for sure the treat that I choose most often because I love them always and forever. 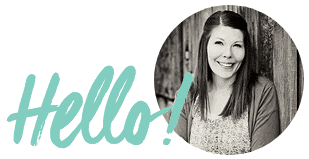 It’s so fun to have a donut recipe up your sleeve, too, because they make for a fun treat to share with friends. I love food that brings people together! This post was originally published in December 2009 and has been updated, rephotographed, and re-shared in December 2018. Your recipe has 2 T. ________, I’m assuming yeast. 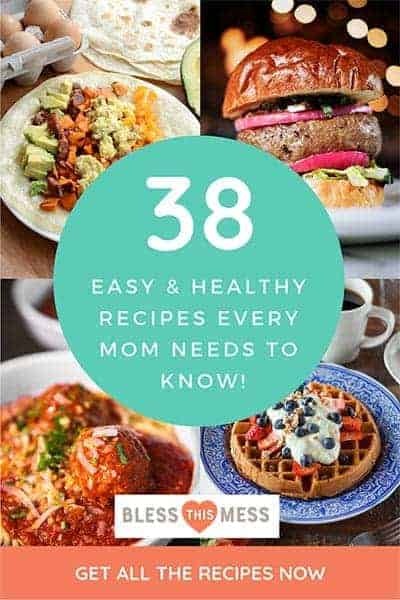 Thank you so much for all those recipes ! I missed the donuts, and the good old US family cooking. 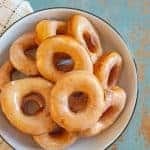 Just bought a frying machine, so I will introduce it to your donuts recipe ! I love to cook, especially when I travel, it’s the best way to learn the culture and the language. Best way to know the people. Being french, I cook french food, but I learned to bake Dempfnüdel;, SauerKraut und Bradwûrst in Germany, I learned some Thai and Viet Nam recipes with a Vietnamese Friend, etc… When I was in the US, ages ago, I learned to cook Banana and Pumpkin Bread with friends, chili and tacos with an Hopi Lady. Cooking in the US is soo rich, every State has its own culture and specialities, from the Poo”boy and Gumbo from New Orleans to the San Francisco Clam Chowder, the NY Cheesecake, etc… Will keep your site in my fav and come right there whenever I want some US Food and souvenirs ! What a wonderful food culture you have made for yourself! And thank you for leaving a kind review and introducing yourself, it’s so fun to hear who’s reading and making my recipes. The internet can be a lonely place sometimes but you’ve sure made it brighter. THANK YOU! Is there a way to halve this recipe so it doesn’t make so much? Yep, you can just half all of the ingredients and it’ll work great!